Hot Dog Relish is a pickled condiment used to dress hot dogs with in North America. It is usually a combination of Sweet Pickle Relish made from cucumbers, and yellow American hot dog mustard. It provides a bit of a two-in-one shortcut for two typical hot dog condiments. When you mention Hot Dog Relish, however, it can be interpreted differently in different parts of North America. 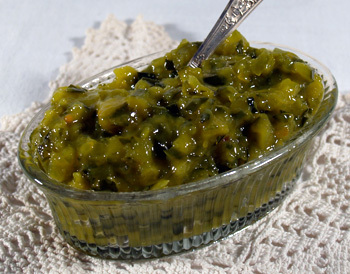 In California and in Canada, it is the yellowish mustard relish mentioned above. In Chicago, however, Hot Dog Relish would always be perceived as just the sweet, fluorescent green relish known as Sweet Pickle Relish, with no mustard stirred in. In New York, many people might think of an onion and tomato relish, which is made from finely chopped onion, simmered in ketchup and spices. Well-known brands are Sabrett’s and Boar’s Head. And regional variations, of course, get blurred by people moving about and taking their language usage with them. Definitions also get blurred by people expressing their own personal preferences rather than necessarily reflecting the usage of the region they live in. However, when you buy Hot Dog Relish commercially, bottled and labelled as such, it is almost always going to be the mixture of Sweet Pickle Relish and mustard. Served with sautéed quartered tomatoes, and fried onion rings.